Up here on this part of the Maine Coast, the landscape tends to be rugged—rocky shorelines punctuated by stark pine and spruce trees, landscapes softened by the occasional meadows of a saltwater farm. Architecturally, the coast is populated by a mix of classic old New England architecture, utilitarian structures, and summer cottages, most of which follow the traditional, fairly organic shingled bungalow or cottage styles. A few times, genuine grandeur comes into play, and in the early 20th century, quite a number of Italian style villas, stucco with red tile roofs sprang up in the more fashionable locations. In recent years, a few modernist buildings have made inroads—as I type this, a lavish compound by Gwathmey Siegel, more usually associated with the Hamptons, is going up in nearby Northeast Harbor, replacing a simple old cottage by Peabody & Stearns. But to the architecturally aware boater along the coast, few sights are more surprising than this house, a prairie style house that has somehow blown in and landed on a rocky ledge amidst the pine and spruce on the harbor shore, a location as far in spirit from the midwestern prairies as can be imagined. The house was built for Otis Ward Hinckley, owner of the Hinckley & Schmidt bottling company in Chicago. Mr. Hinckley had Maine roots, being the great-grandson of Reverend Jonathan Fisher (see last Saturday’s post). O.W. Hinckley’s main residence was a roomy traditional house in the Chicago suburb of Evanston, near Oak Park. 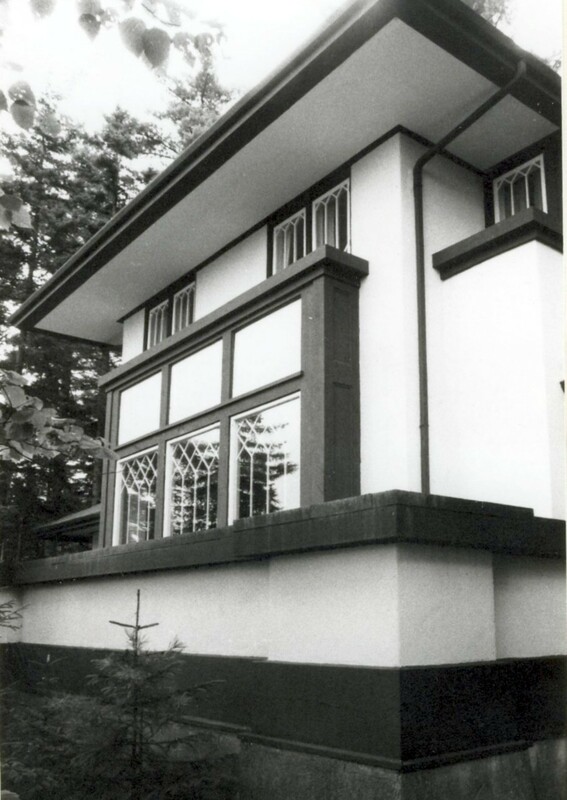 where Frank Lloyd Wright was developing his distinctive early style. It is obvious that Hinckley was well aware of the work going on in the Chicago area. Gossip has always had it that he contacted Wright to design this house, and stern Yankee businessman that he was, found Wright too expensive and uncompromising. Whatever the true story, in 1911 Hinckley instead contacted his distant cousin, Wallace Hinckley, a recent graduate of Carnegie Tech, who had just started his career (and incidentally was one of my great-grandfather’s closest friends), and according to his daughter who later owned the house, basically said, ‘here, design me one of these’. 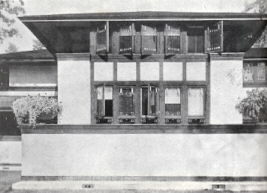 The result was a house loosely modeled on the Ward Willitts house by Wright, but far more simply detailed. The cost was $15,000. Inside, there were six rooms centered around a huge living room. 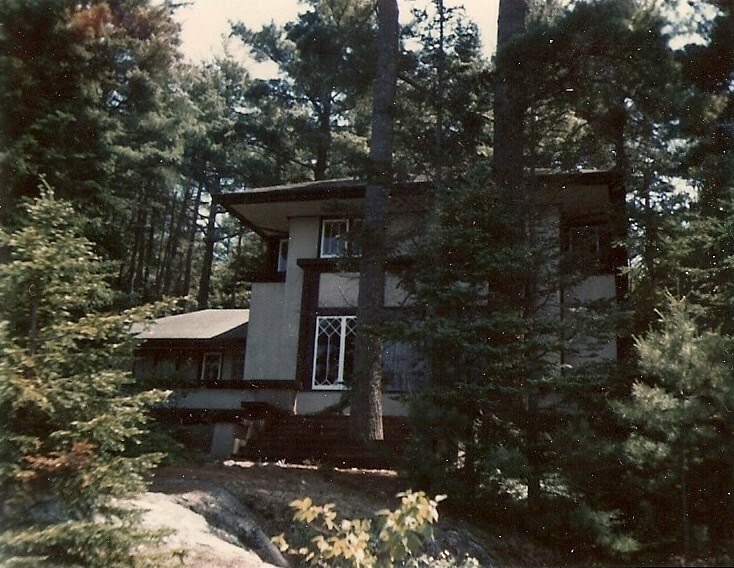 The Prairie influence did not carry over to the interiors, which were in standard issue Maine summer house Arts & Crafts, with a large beach stone fireplace on the interior wall. The little estate, including a charming water tower, was inherited by O.W. 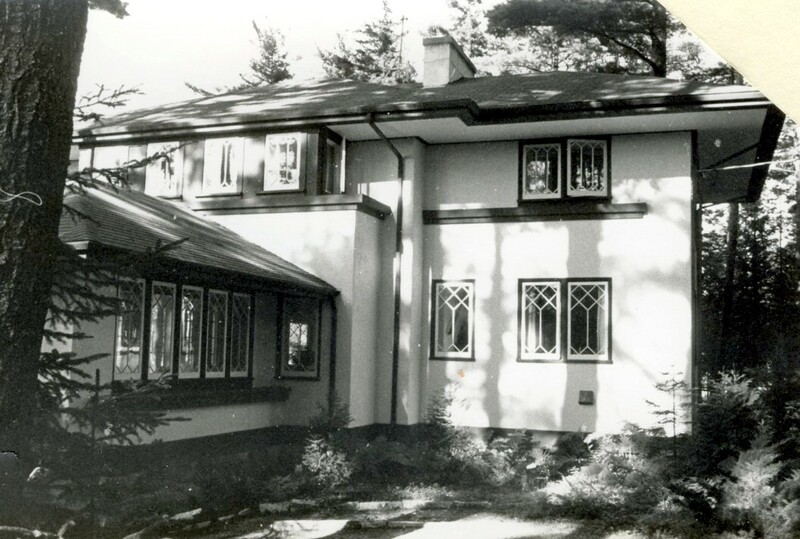 Hinckley’s daughter, Ethelwynne, who, selling her father’s company to Schweppes, decamped Chicago for the more convivial Colony Club in the winter, and her Prairie style house in Maine in the summer. The house is still in private hands, and is listed in the National Register of Historic places—-as a rare example of the Prairie style adapted to the Maine Coast, of course. "The Prairie influence did not carry over to the interiors, which were in standard issue Maine summer house Arts & Crafts, with a large beach stone fireplace on the interior wall." Do you have any interiors to look at?Whereas I am very familiar with the philosophical underpinning of arts and crafts, I am not at all familiar with the philosophical underpinning of Prairie style. Were the two incompatable? A fancy interior designer friend once proclaimed that"the Mission is the most plebeian of all decorating styles. "Funny it cost so much. Hels, what I should have said is that the interior finish is very basic and plain, and could be in almost any style house, with none of the carefully crafted and designed qualities of a Wright interior—beams, horizontality, room dividers, etc.Raina—I've always found American Arts & Crafts/Mission the most pretentious of styles for that very reason—its reverse snobbery—founded on a very dogmatic principle, involving high minded notions of the nobility of it all—-yawn…..give me the warm and lively arts & crafts of the English movement, thank you very much. As a Carnegie Mellon grad, back in the day when this was built it was Carnegie Tech (but thats just being picky! ).Love this house in this location -it fits somehow, doesn't it?And yes- FLW was over-whelmingly expensive and didn't stick anywhere near any budget – much like some of the 'big name' architects of today who shall remain nameless!